I was so glad to find out I could make one of those delicious restaurant-type salads at home. You know, the kind with fresh greens, stinky cheese, fresh fruit, and a nice balsamic or fruit-based dressing. This salad was absolutely wonderful, and what's better, so many different substitutions can be made for each ingredient. 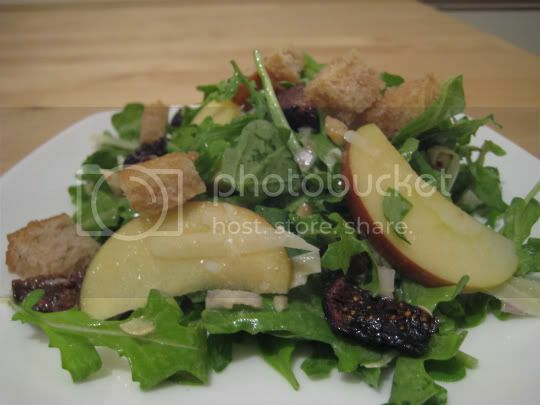 The recipes called for fresh, bitter, spicy arugula; crushed hazelnuts; sweet, chewy, sticky dried fig pieces; crisp, juicy apple slices; and a nice salty, nutty, savory Gruyere (similar to Swiss) cheese. All of that was tossed in a white wine vinegar, hazelnut oil, and Dijon mustard dressing with shallots for a nice, tangy complement to the fruits. To top it off, I made croutons from whole wheat sourdough bread cubes tossed with more hazelnut oil. (Don't worry, the hazelnut flavor is not overwhelming, but adds a nice subtle nuttiness.) I couldn't get enough of this salad! This is great as a first course, or doubled as a main course. Make again? Definitely. And I'd love to experiment with ingredient substitutions...pears or raspberries, blue cheese or gorgonzola, walnuts or almonds, mixed greens or baby lettuces...the list goes on.